Richard Aspel’s dynamic, tour-de-force performance imbues Sonya Hartnett’s beautiful and heartbreaking children’s tale with an emotional depth and humanism befitting of the subject matter. Set in WWII, The Midnight Zoo finds two Romani gypsy siblings, Andrej and Tomas, feeing from the Nazis and seeking safe haven in an abandoned, hidden zoo, which boasts a collection of self-aware, talking animals who, like the brothers, display an unwavering hope and strength in the face of unspeakable atrocity. Aspel deftly captures the trembling whimper of a nine-year-old boy and the raspy bellow of an anthropomorphized wolf with equal finesse, and elevates this seamless blend of historical fiction and magical realism to greater heights. Two gypsy boys are fleeing through a war-ravaged countryside during the night, carrying a secret bundle. The boys stumble across a town that has been reduced to smoking rubble, and a zoo that is still intact. 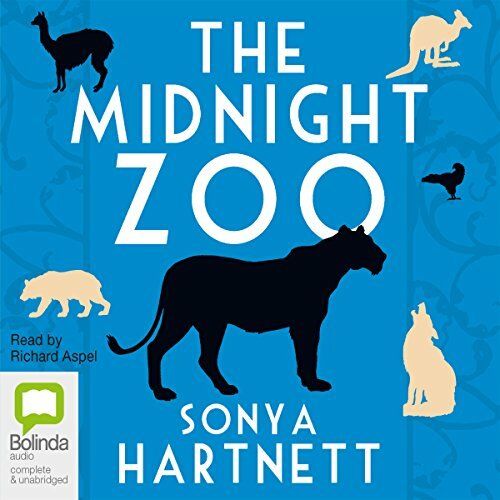 When the boys take shelter in the zoo, they discover a menagerie of talking animals. Both the boys and the animals tell their tales and speak of their desire for freedom. Like The Silver Donkey and The Ghost’s Child, this is another beautiful fable-like tale that will move you to tears. It’s a story that will appeal to all ages, that merges history with fantasy; adults will enjoy this as much as children.